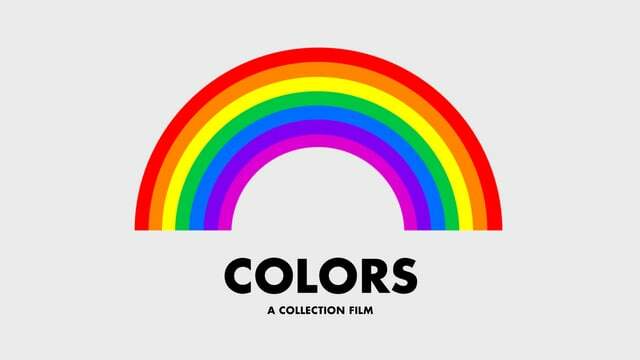 I am a graphic artist, so the perception of color plays a major part in my career & my life. This video I saw on Gizmodo is a basic concept, showing a medley of images grouped together by color. 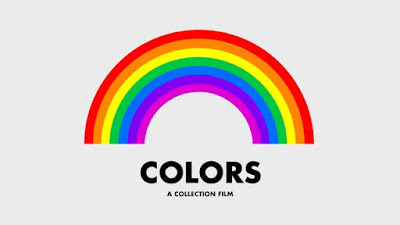 However, it illustrates the rich variety of visual form and color passing before our eyes, that most people take for granted every day. 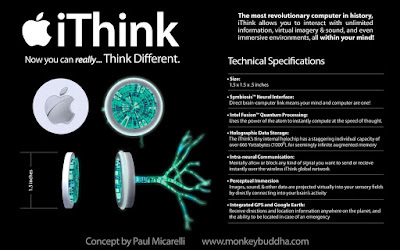 I created this blog, The Monkey Buddha, 10 years ago today, on June 28, 2005! The very first post I wrote was about a creation that I feel is one of my most notable achievements so far. It is an award-winning strategy game that I designed, based on the timeless principles of 'sacred geometry', called "Da Vinci's Challenge". "Hopefully, this will be a place where I can finally share the ridiculous amount of info I have stored in my brain and its silicon symbiote I call my Apple Computer. I am looking forward to posting all kinds of important news, nuggets of crazy wisdom, interesting technologies, political rants, and useless fun crap. Please bookmark this site and check back every once in awhile... I will try to be vigilant & continue posting new items. Basically, this blog will reflect the world and its infinite complexity - from my own infinitely limited perspective. To celebrate the 10 year anniversary of this creative endeavor, I wanted to share some interesting things about it. Since I started posting to The Monkey Buddha, I've been able to fit every one of the 1,591 posts to date into one of these categories- click the links to explore! Here are the Top 5 most viewed posts, since I created the page. My review of the iPhone was by far the most popular article. Although I love to write about all different topics, I am a professional graphic artist. 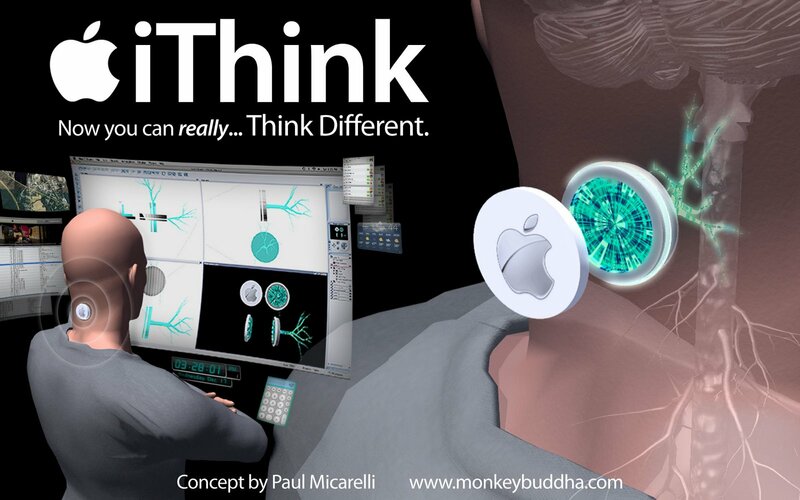 The Monkey Buddha has also been a place to show my art, such as 3D renderings and graphic design work. After years of uploading images, I've also built up a huge database of visual imagery in my Picasa Web Album. For me, blogging has always been a purely creative pastime, an opportunity to express my thoughts and interests publicly for anyone who happens to see it. I truly appreciate anyone who follows this page or The Monkey Buddha Facebook page. I have never tried to directly make money from this page. There have never been ads or even a donation button on the page. On occasion, I have shared some products featuring my designs that are available in my Cafepress shop. Like so many others, I am a endlessly creative person, and this blog is a tremendous outlet for my ideas. It is a credit to Google that they offer this free blogging platform to people. Sometimes I wonder, though... What would happen to all my work if Google or the Blogger service stopped existing? Would all my thoughts & work be lost? It's almost like the idea of a Tibetan sand mandala, where the intricate creation of the Buddhist monks is swept away after completion, leaving no trace. It is a meditation on impermanence, the fact that neither we humans nor our accomplishments will last forever. However, there is the possibility that, because I've had the opportunity to add my presence to the Internet's electronic hive mind, my writings and artwork will outlive me for a time. Hopefully, humanity will expand into the Universe beyond Earth, and my thoughts & artistic work will continue to exist in the repository of our species' shared knowledge as we travel to the stars. I'd like to think that the content of this blog will last for many more years, and perhaps even decades- so that The Monkey Buddha can continue to inform, entertain, and perhaps enlighten others into the future. 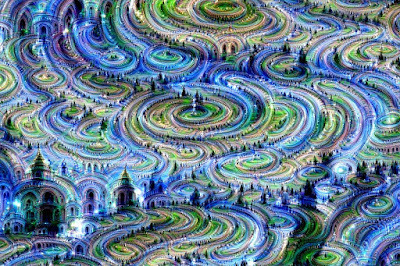 I recently read about research that Google is doing using their image recognition neural networks. These networks, that mimic the neural architecture of the brain, are programmed to recognize features of pictures such as people, animals, and buildings. Google software engineers have taken these image-detection algorithms and tweaked the process, so it essentially goes in reverse. Instead of recognizing existing features in an image, the computer looks for and generates imagery where there isn't any already. 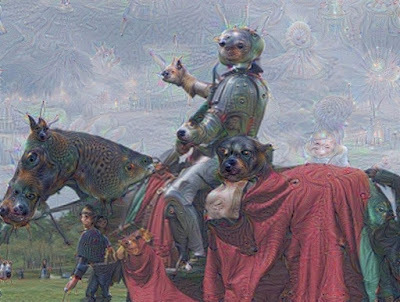 The results of this process are psychedelic, slightly surreal artificial visions that the Google engineers call "Inceptionism". For instance, the network can be given an image and instructed to search for edges, which are enhanced and filtered with colors. It can also "dream" of images that aren't there, by searching for familiar forms and reinforcing them- as in this image of a cloudy sky, in which the computer pulls out animal-like forms. This is similar to a human daydreaming and finding recognizable shapes in the clouds. 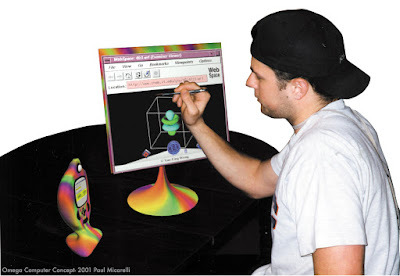 The important aspects of this process are the image recognition feedback loops, applied to the visual analysis that the computer is making. It is an iterative process of searching for recognizable features, then re-applying it over and over, to create hallucinatory fractal visuals. Perhaps this is a glimpse into the nature of the psychedelic experience, in which the brain experiences resonant feedback loops of information. 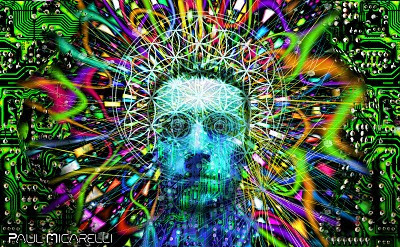 The brain normally suppresses neural activity and feedback patterns that would be hallucinatory & distracting, but I suspect substances that unlock visionary states open up this activity. Although this may help us to understand what is going on when a person has a psychedelic experience, the research is also useful for understanding consciousness, in general. 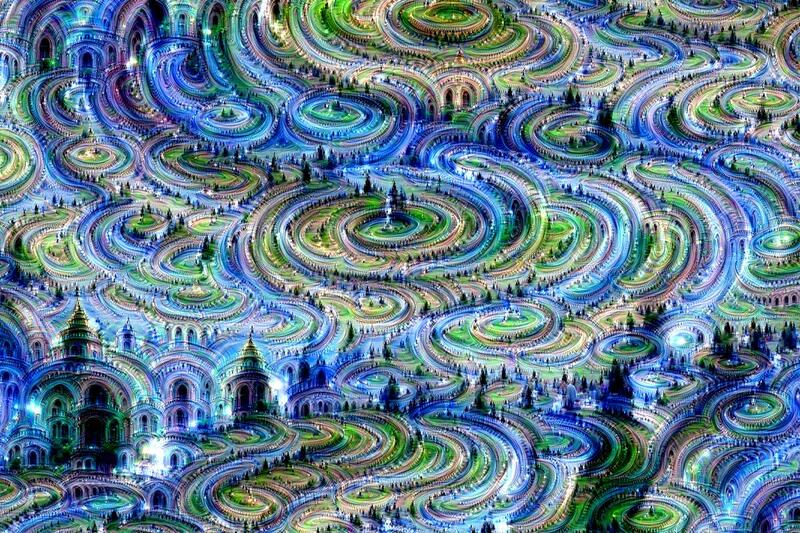 There is even an interactive livestream Twitch channel of a neural net bot that creates ever-changing psychedelic imagery in real time. The visual output is based on user suggestions, derived from a predetermined list of inputs. These inputs are categories of a million images that were previously introduced to the network. I have a lot of photos of my Dad sleeping in many different chairs, on many different occasions. He has worked hard in the food retail business all his life, but when he gets a chance to sit down & relax, it usually turns into a snoozefest. Family events or holidays inevitably become napping opportunities for the big guy. My old friend Dan J. gave me the idea- to have pictures of my Dad sleeping right through important times in history. 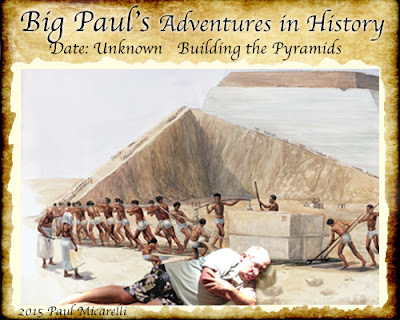 I thought this idea was hysterical & created this series of "snapshots" showing Big Paul experiencing historic events, in his own special way. This is the sixth set of of "adventures," as he sleeps his way through the most important events in history. To commemorate my Dad's birthday & Father's Day, I made the 3 new History Adventures below. As Egyptian workers toil on the Giza plateau, my Dad slumbers in the desert sun. 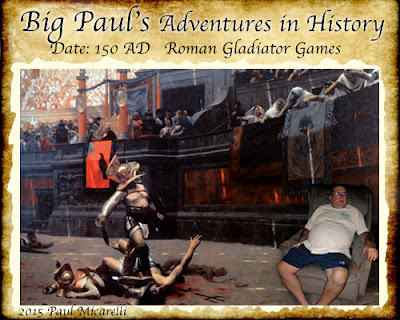 Despite having a front row seat to the bloody spectacle of Colosseum gladiator battles, Big Paul is not amused & sleeps through the noise of a roaring crowd. As a primitive human struggles to harness the power of fire, my Dad Paul effortlessly takes a power nap. 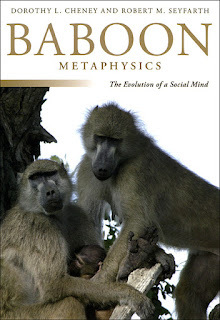 I recently finished the book Baboon Metaphysics, that my girlfriend's parents gave me last Christmas. They know I love anything about monkeys. The book details some of the field studies of communication that goes on between baboons, as well as other primates. The book also hypothesized about the nature of the monkey mind, and how it is similar and different from the human mind. Although there was detailed evidence of meaningful calls & signaling, the authors stopped short of claiming that the monkeys actually had "language" as we understand it. I think the line between animal communication & human language is a fuzzy one, arbitrarily delineated by us humans. Although they don't have grammar and sentence structure, animals are clearly communicating complex ideas. 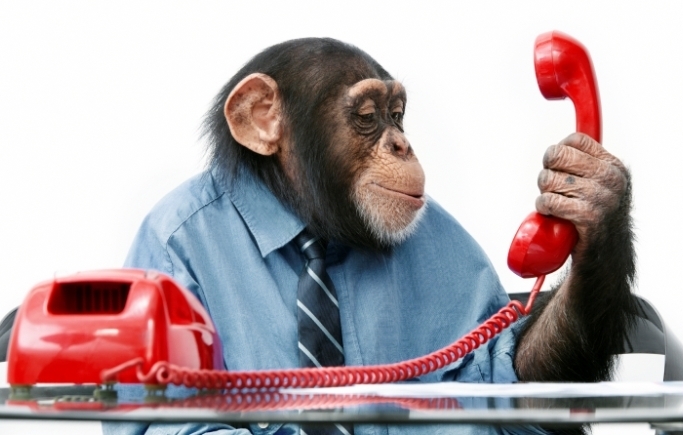 Chimps & other animals have been proven to be highly intelligent, even surpassing humans in some ways. It is interesting that animals were trained to understand human language, and only now are we beginning to unlock the meaning in animal socializing. Perhaps one day there will be a way to achieve a fluid understanding between humans & other living things. This will greatly increase the empathy that people have for Life, in all forms. 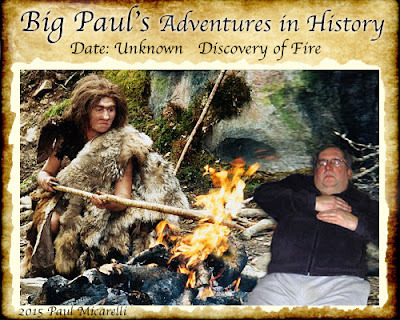 I was doing random Google images searches, for a new round of Big Paul's History Adventures for my Dad's birthday. While I was looking for pictures of the Egyptian pyramids at Giza being built, I came across some interesting things. The size and antiquity of the pyramids makes them an irresistible source of mystery & wonder. I've studied many different theories on their construction & purpose, and I think some ideas are more likely than others. I found this digital painting at Letter from Mad Plato, showing cybernetic aliens supervising the construction of the pyramids using advanced technology. It's fun to wonder about the possibilities, no matter how outrageous they may seem. Despite the staggering scope of these immense (& seemingly superhuman) structures, I am pretty confident that their creation is well within the engineering capabilities of ancient humans. 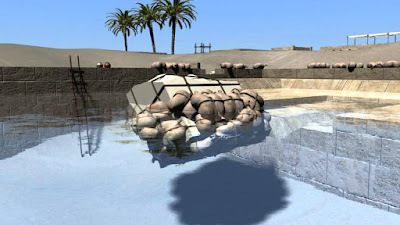 During my search, I also watched this video that makes a compelling case for the use of hydraulic engineering in the construction of the Great Pyramid. I think this theory by Chris Massey is definitely thinking outside the box. 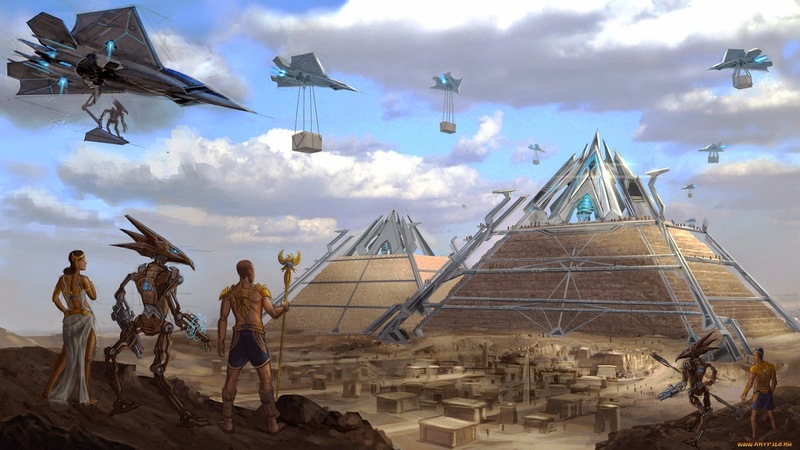 There are some obvious problems with the ideas presented, but it's more likely that the pyramid builders used the laws of nature more than other-worldly alien tech. using air-filled animal skins bundled with papyrus. 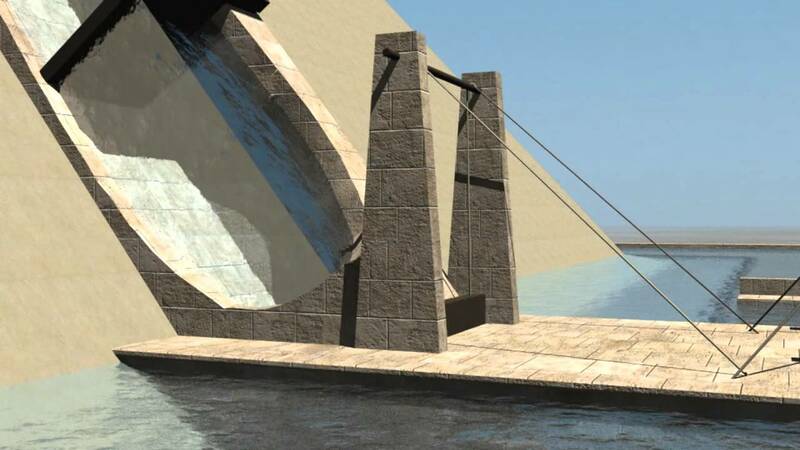 A hydraulic lock in an enclosed water channel, going up the side of the pyramid. 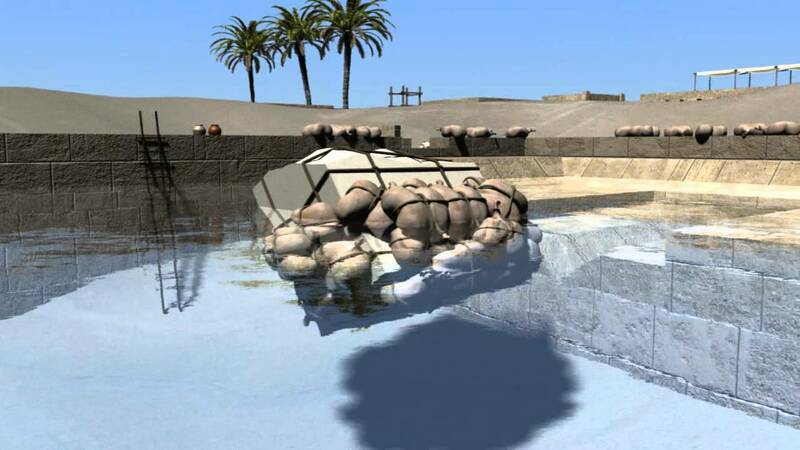 The floating blocks would rise to the top of the construction using natural buoyancy. A glaring question about this theory would be: How would the Egyptians have created enough pressure to maintain such a massive column of water, while also preventing the walls of the channel from bursting? The Romans were able to get water to flow uphill for short distances, but this seems like a much more difficult feat. Regardless of how it was built, the fact is that it was built- using some combination of forces and technology. By using human ingenuity, ancient builders understood that natural forces could be used to do the work, instead of teams of men of animals. Although the Great Pyramid and other ancient structures will always have an element of mystery, we will continue to unravel their secrets as our own knowledge & wisdom as a species grows. In my last post, I shared a project from my college years, called the Omega Computer. The project assignment was to design a computer of the future. Years later, I revisited the challenge of imagining futuristic computer technology & took it a step farther. Since I made those graphics, I've closely followed developments in science and technology that are leading toward a brain-computer interface, like the iThink. I see technology, like my iPhone or computer, as extensions of my mind. The mystic sentiment that "consciousness is in all things" seems more true, the more I look into Reality. The Universe is made up of something more fundamental than particles or atoms- The Universe is made of information. Human consciousness is just one manifestation of the Universal Information Field (UIF), that can manifest in infinite varieties. There is no reason why the ordinary conscious experience of the biological brain cannot be modified or enhanced to create novel states of being. Of course, every step of the way there will be problems and questions that have to be addressed. Certain choices and directions may have unintended or negative consequences. However, I think it is inevitable for humanity to continue to seek new abilities, information, & understanding. We have uniquely mastered technology for this end, and will continue to expand both the individual and collective consciousness through technological means. Perhaps suprisingly to some, this technological innovation will be continue to be simultaneous, and perhaps symbiotic, with deeper spiritual and philosophical understanding about the nature of ourselves and our world. I've collected links which, individually, are amazing developments. However, when seen as precursors to technologically-augmented consciousness, these scientific breakthroughs signal new frontiers in the human experience. • Hive consciousness: Do We Really Want to Fuse Our Minds Together? 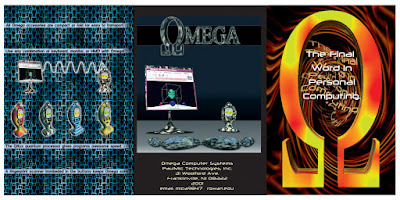 The "Omega Computer" concept was a graphic design project that I created in college, during my senior year at Rowan University in 2001. My project (which I was allowed to choose) was to design "a computer of the future". I wanted to incorporate cutting-edge technologies that I thought would need to be developed for future electronic devices. In 2001, there were no mass market smartphones or portable networked devices. Most people had just monochromatic cell phones (with no cameras). Commercial touchscreen tablets were just hitting the market, but were a long way from being as popular as the iPad would eventually become. I think my predictions have proved to be pretty accurate, because many of these features are now standard functions of the iPhone, Android, and other mobile devices. The eyepiece I designed is similar to Google Glass and other augmented reality headsets. Some of the ideas still haven't been seen on the market yet- like the outer casings of the Omega components being infused with electronic ink (e-ink), so that it can instantly change and display any color, texture, or design. Also, Nikola Tesla's idea of wireless electric power transmission is just now beginning to gain traction in commercial products. 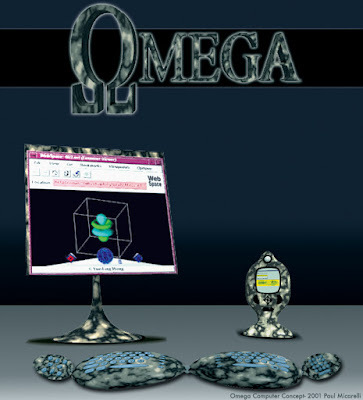 I created the Omega Computer back when I was a graphic arts student, so my design skills were rudimentary compared to what I could do now, after 14+ years of professional experience. I don't think it's too bad, though- considering my inexperience, as well as the limitations of the Photoshop 6 and the Infini-D 3D modeling software I was using at the time. and fully customizable color e-ink skin. It's communication & electric power are completely wireless. housing the Qflux™ Quantum Processor, camera, and color e-ink skin. 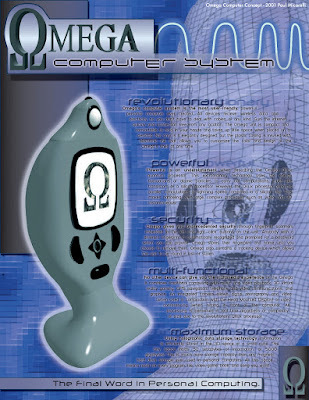 "Revolutionary: Omega's computer system is the most user-friendly, powerful personal computer ever created. All devices receive wireless data and electricity so you don't have to deal with cables of any kind. Surf the internet quickly and connection free from any location. The Omega unit is compact and comfortable to hold in your hands and takes up little space when placed on a desktop. Not only is it elegantly designed, but the plastic casing is infused with electronic ink that allows you to customize the color and design of the Omega's shell at any time. Powerful: Powerful is an understatement when describing the Omega Qflux quantum processor. This extraordinary technology uses the energy fluctuations of atomic particles to carry out computations, much like transistors of a silicon processor. However, the Qflux processor performs parallel computations at lightning speed compared to a silicon chip. This makes handling even large, complex processes such as video and 3D instantaneous! Multi-functional: No other device can give you the multimedia experience of the Omega. It combines traditional computing with music and video playback, 3D virtual reality gaming, GPS navigation, telephone and video communications, and graphics. An integrated camera allows digital photography and video (when used in combination with the Head Mounted Display) or video conferencing when sitting in front of the computer. All processing is performed in real time regardless of complexity or size due to the revolutionary Qflux processor. Maximum Storage: Using holographic data storage technology, information is efficiently stored in the 3D space of a small cube. This tiny space holds 50 tetrabytes of information, or 5,000 gigabytes! This is much more storage capacity than any magnetic hard drive storage ever used in personal computers. All this space means room for every program, file, video, game, book, and song you want!" can be either placed on a monitor stand or held. 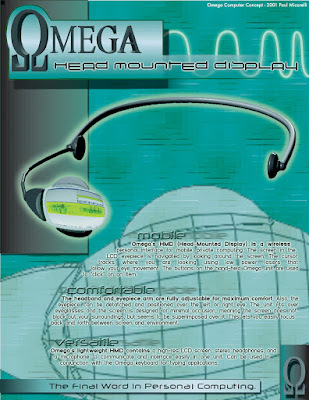 Info sheet for Omega Interactive Display. 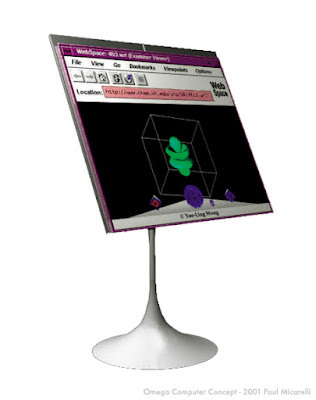 "Interactive: Omega Interactive Display is a flatscreen, touch-sensitive LCD monitor that allows you to write, choose items, draw, and navigate directly using the Omega stylus. Input devices such as the mouse and drawing tablets are unnecessary with our easy to use interface. Compact: Our 17" display is 95% viewing area, with almost no surrounding casing to take up space. You get a combination of sight and sound in one compact unit with the stereo speakers embedded behind the screen. The display also folds in half for easy transportation or storage. Wireless: Since the Interactive Display is powered by our wireless electricity transmission and also has a wireless data connection to the Omega Computer unit, there are no cords or batteries to deal with. This means you can use it anywhere- on the sofa, in the kitchen, or outside! If you want to stay in the office, you can attach it back to its stand for a space-saving work area. Multi-media: Our Interactive Display contains high-quality 6"x9" flat stereo speakers to complete the Omega multimedia experience. Watch video, enjoy lifelike gaming, or hear crystal clear music while computing without the burden of seperate speaker hookups!" 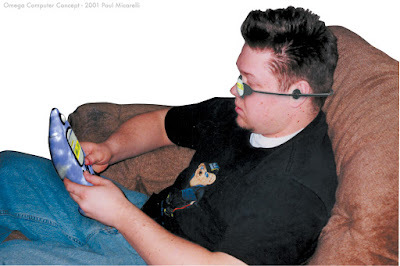 The Head-Mounted Display is an eyepiece, with a microphone, earphones, and a high-resolution screen that tracks your eye movement. 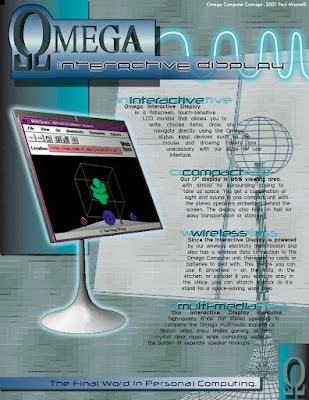 It is fully interactive with the other Omega™ computer devices. "Mobile: Omega's HMD (Head-Mounted Display) is a wireless personal interface for mobile, private computing. The screen in the LCD eyepiece is navigated by looking around the screen. The cursor tracks where you are looking using low power lasers that follow your eye movement. The buttons on the hand-held Omega unit are used to "click" an item. Comfortable: The headband and eyepiece arm are fully adjustable for maximum comfort. Also, the eyepiece can be detached and positioned over the left or right eye. The unit fits over eyeglasses and the screen is designed for minimal occlusion, meaning the screen does not black out your surroundings, but seems to be superimposed over it. This lets you easily focus back and forth between screen and environment. Versatile: Omega's lightweight HMD contains a high-res LCD screen, stereo headphones, and a microphone to communicate and interface easily in one unit. Can be used in conjunction with the Omega keyboard for typing applications." is ergonomic and folds up to be easily transported. so the keys and skin are fully customizable. 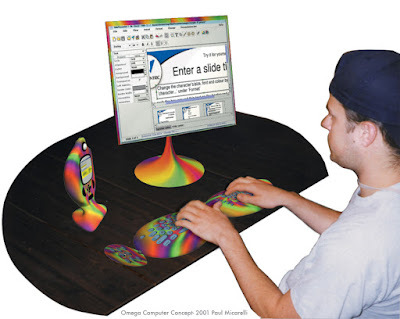 The Omega computer being used with the keyboard and the screen on its monitor stand. All the Omega components have full color e-ink shells, for fully customizable appearance. The Omega computer being used with the interactive touchscreen with a stylus. All the Omega components have full color, e-ink shells for fully customizable appearance. The Omega computer being used with the Head-Mounted Display (HMD) eyepiece. All the Omega components have full color, e-ink shells for fully customizable appearance. he Omega computer has un-hackable quantum encryption and fingerprint scanners for maximum security. All the Omega components have full color, electronic ink (e-ink) shells for fully customizable appearance. This is the first computer system to incorporate e-ink on the outside casing. Changing the color, pattern, or design of your Omega devices is as easy as changing your desktop wallpaper! • These are the outside panels of a brochure presenting information about the components of the Omega computer system. • These are the inside panels of a brochure presenting information about the components of the Omega computer system. "Wireless: Omega and all peripheral devices are wireless, meaning no connections or power cables! With PaulMic Technologies startup plan, for one low price you receive wireless power to your unit for as long as you own your Omega, NO BATTERIES OR CORDS NEEDED! All device and internet connections are cableless, so there is no hassle of confusing hookups. Powerful: The Qflux quantum processor uses atomic energy fluctuations to compute faster and more efficiently than any silicon chip. 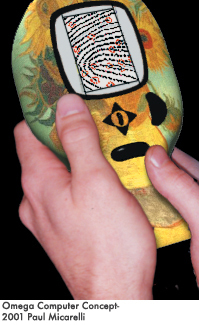 Now the infinite possibilities of this technology are in the palm of your hand for graphics, gaming, and calculations. Now files that take enormous processing power, such as video and 3D rendering are instantaneous and take place in real time. The Omega's holographic data storage gives you 50 tetrabytes of storage for all the files and programs you'll ever need. Store libraries of music, games, and video in a space the size of a sugar cube! The cube-shaped storage unit stores data simultaneously in 3 dimensions for compact storage and instant retrieval. Versatile: You don't work on Omega, you work with Omega. This is the first computer designed to conform to your needs at any given time. You can use any combination of peripherals with the Omega unit depending on your situation. the Omega combines the functions of a multitude of devices for a single, integrated, true multimedia experience. The Omega runs traditional computer programs, from word processing to graphics, a digital video/still camera, a GPS navigator, phone communication, music & video playback, ability to store and read volumes of ebooks and magazines, and high-tech gaming. Stylish: The Omega unit, keyboard, and monitor stand all have a state of the art color electronic ink infused into the plastic. This allows you to customize the outer appearance of any of these devices with any color, pattern, or design that you like- at any time! 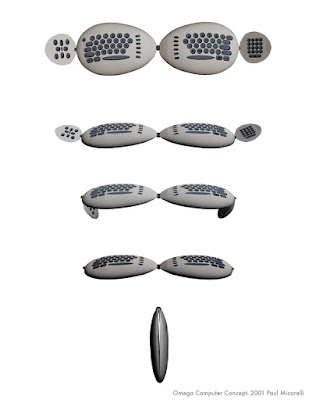 Also, all Omega products are ergonomically and aesthetically designed to appeal to your sense of comfort and style. Secure: Omega's click buttons read your fingerprint for personalized security. If someone else wants to use your Omega, all they have to do is type or say a designated password when prompted. Omega will then recognize their fingerprint when used. Therefore, you have peace of mind knowing that only you or your family and friends can access your Omega. If lost or stolen, the Omega has an embedded tracking device that works along with its GPS system to allow authorities to pinpoint its exact location. Portable: All Omega devices are designed for easy transport and use on the go. The computer itself is lightweight and small enough to hold in your hand (the picture at far left is actual size). The touch-sensitive flat screen monitor and keyboard fold up for compact storage. 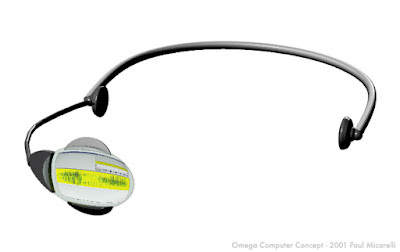 The head mounted display unit is omega's mobile interface with integrated microphone, earphones, and LCD display. Best of all, there are no wires or batteries to deal with when on the go thanks to Omega's wireless energy receiver." This image I saw on Reddit definitely puts our small part of the Universe in perspective. It is a visualization of the area (the blue sphere) in the Milky Way galaxy containing all the stars visible in the night sky from Earth. All the stars that we can see with the naked eye are actually confined to a very small section of our galaxy. There are countless stars throughout the rest of the galaxy that are not visible from our relatively tiny planet. 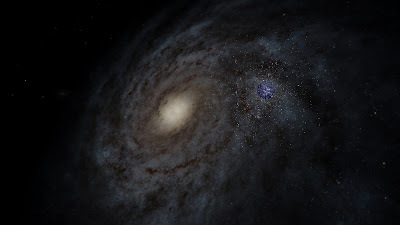 Of course, the Milky Way is just one galaxy among billions- each with billions of stars. The scale of the universe is truly incomprehensible, and leaves the mind reeling at the size & complexity of our reality. 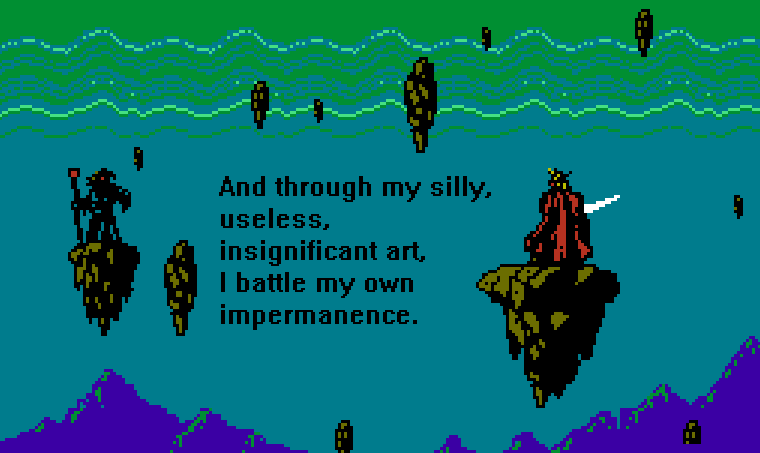 On BoingBoing I saw a few images from a Tumblr blog of 8-bit computer art with random sayings. Why do people feel the need to create or leave any kind of lasting impression? Art & creative activity is a way to extend ourselves in space & time, to try and overcome the overwhelming reality of impermanence. in billions of years, no physical record of our individual lives will exist. The human race very probably won't even exist. So, in the long run, does anything really matter? Even if the answer is "No. "- that doesn't mean we have to feel despair, or that we can't experience things positively. In fact, the idea of impermanence can make one even more compelled to live fully and soak up what each moment & experience has to offer.